Apple has just made iTunes Radio official over at WWDC 2013, with the new service set to bring music streaming to iTunes users. 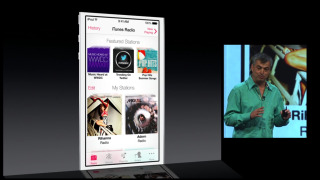 iTunes Radio is built into the music app on iOS 7, iTunes and Apple TV. It will be a free service, but you'll have to put up with ads. If you don't fancy the ads interrupting your music then you'll have to subscribe to iTunes Match to do away with them. The music streaming service is coming to the US first, with other countries being added over time. It is set to launch in the US this fall (that's autumn to the rest of us). Apple's Eddy Cue ran through Pandora-like 'radio stations' which it hopes will revolutionise how you find new music - with the ever-present buy button reminding you that you can, of course, buy the songs from iTunes. iTunes Radio is also the first music streaming service to feature Led Zepplin, which will please a certain portion of you we have no doubt.